Starting at 10am down the South Shore we’ll have lots of tomatoes, lots and lots of cherry tomatoes, teen spicy salad mix, teen arugula, sweet salad mix, lots of various lettuce heads including large romaine type, just a few cucumbers, seasoning peppers, green bell peppers, a few Serano peppers, red and yellow-fleshed watermelons, lots of winter squash, various varieties. Farmer Luca’s favorite Tahitian pumpkin is now ready, also lots of large butternut winter squash sliced in smaller portions. Baby carrots, onions, radishes, beets, lots of various cooking greens including three kinds of kales, dandelion greens, cilantro, dill, parsley, Italian basil, Thai basil, lemon basil, garlic chives, holy basil, sage, thyme, lemongrass, lots of baby ginger, lots of baby turmeric (which freezes beautifully and then is handy and easy to microplane into whatever dish you’re cooking), lots of colorful zinnia flowers, and fresh figs. We will have two cash registers set up for speedier service! Bring water to a boil. Add ginger and turmeric. Reduce heat and simmer for 15 minutes. Pour into cup(s), add 1/2 & 1/2 or whatever non-dairy thing you want, and honey. Stir. Sip. Be happier than you were 20 minutes prior. ARTfarmers make this adding a bunch of fresh lemongrass in the water. Heavenly warm or cold. And makes your house smell amazing, this. Pop-up Farmer Katie photobombs the early morning greens harvest. We are experiencing pre-nostalgia for our wonderful employee Katie who, along with her farming talents, beautiful smile, sense of humor and stellar work ethic is moving back to the states in January. WAAAAAAHHH! 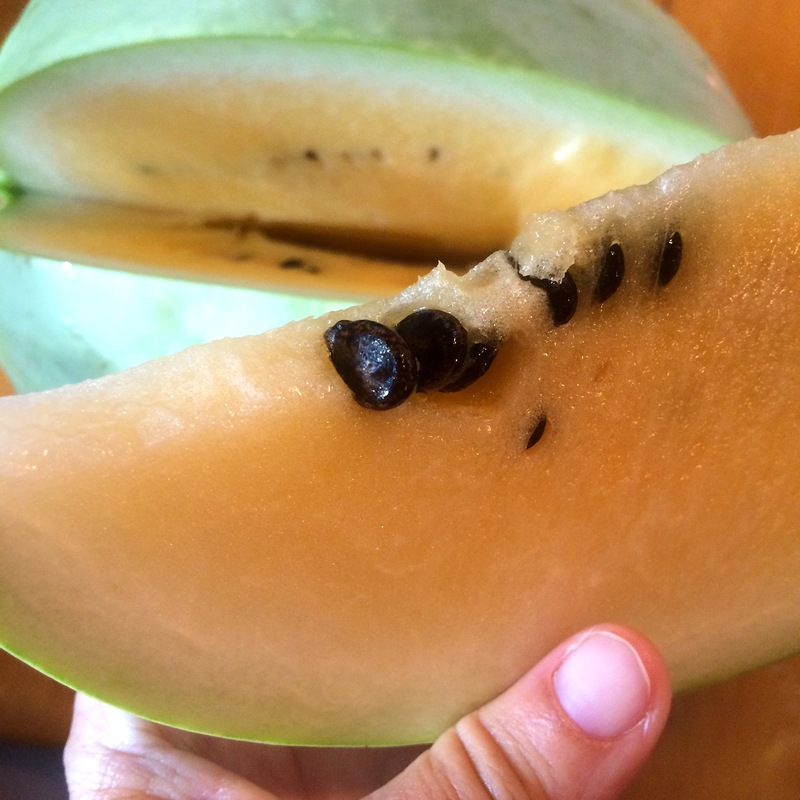 Nothing sad about these sweet, rainfilled flavor bombs we call WATERMELONS. Seriously! 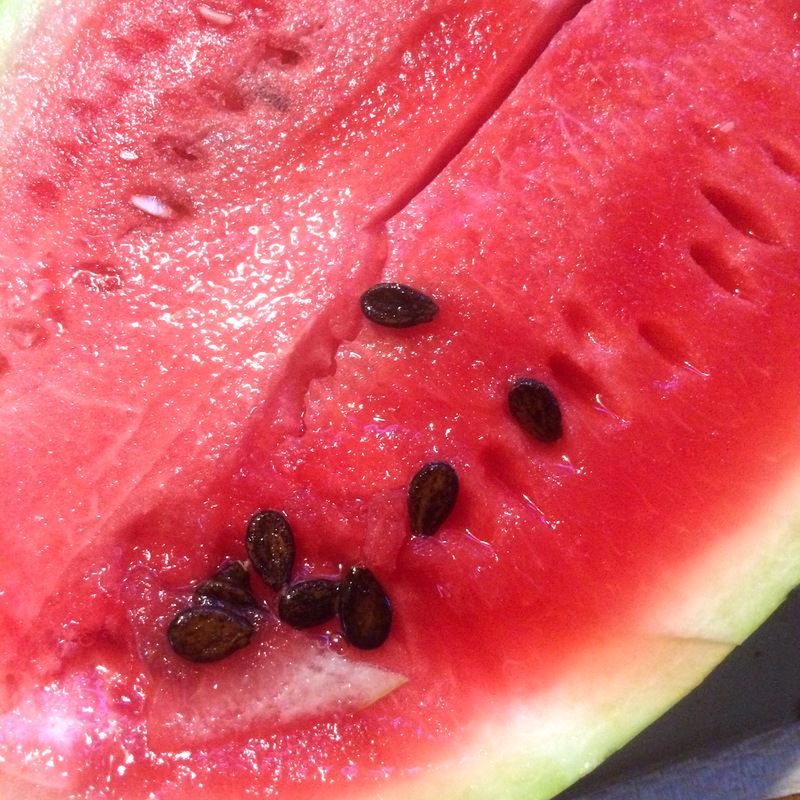 Cut the watermelon into nice 1″ thick steaks. Brush with a little olive or coconut oil, and grill for about 5 minutes until you get some nice grill marks. You can consume it immediately or add a little salt and pepper or other spices. Experiment! This is great over fish or other protein main, with some hot pepper salsa perhaps. We recall faintly that Chef Dreads at Savant used to melon-ball (yes, that’s a verb) watermelon into large spheres before grilling, perhaps. We’ve got tons of crispy fresh organically grown salad greens for you in a variety of configurations, from the tiniest little baby arugula leaves to our generous crunchy sweet mix with red and green leaf varieties. Super fresh so it lasts a long time in your fridge. We’ll start to have a few slicer tomatoes for Saturday and a few more pints of cherry tomatoes. Crazy tomatoes should start in about three weeks if we can beat the bugs, right now we are picking more caterpillars than tomatoes off the plants. Trickle down tomato economics will apply until then, we suggest in case of tomato emergency, you try watermelon, or fresh figs, in place of tomatoes in salad! Here’s the list: Sweet salad mix, teen arugula, teen spicy salad mix, crispy cucumbers, loads of watermelons, a few pints of cherry tomatoes, a couple of slicing tomatoes, lots of cooking greens, escarole, dandelion greens, radishes, onions, scallions, sweet potatoes, Italian basil, holy basil, lemon basil, lemongrass, cilantro, dill, recao, beautiful spicy baby ginger, papaya, passionfruit, sweet Japanese mini melons, and cut flowers. We will be closed Saturday, Christmas Eve as it is usually very slow. We WILL open Wednesday, December 21st (the winter solstice) 3-5:30pm and Friday, Dec. 23rd 3-5:30pm for you last minute shoppers! We do offer gift certificates if you’d like to give the gift of fresh produce for the holidays! We need a couple of days lead time on those. Open Today 3 – 5:30 PM, Bounty!! Sweet salad mix, teen spicy salad mix, teen arugula, cucumbers, loads of watermelons, a few cherry tomatoes, lots of herbs, scallions, onions, cooking greens, radishes, beautifully just picked sour oranges, passionfruit, baby ginger, fresh Mediterranean figs, papaya, and local honey. It just keeps on raining! We swore we would wait another few weeks to open Wednesdays but the watermelon harvest is just too big and bold not to share! Ho-ho-holy cow! We’ve had some 20 pounders this week and the rain has not let up. Please help us eat these sweet delicious monsters before they crush our house and break down all the fences. Hunting melons by flashlight. 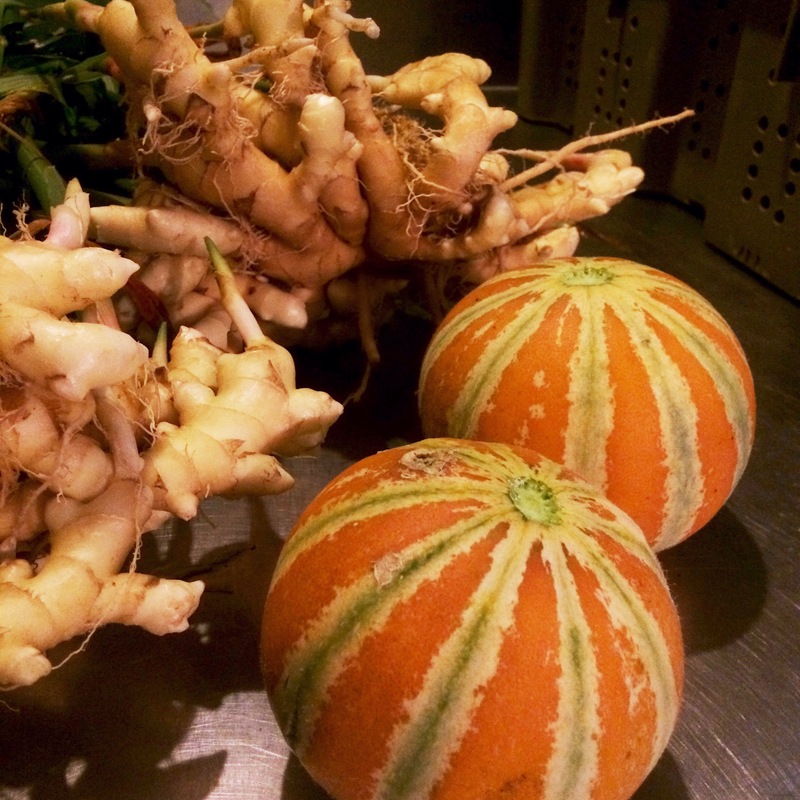 A late harvest of young ginger and pungent Punjabi mini honeydew melons. Lots of fresh greens from all the rain. Come out for 10 AM tomorrow morning and you’ll find: Sweet salad mix, baby arugula, teen arugula, baby spicy salad mix, teen spicy salad mix, escarole, several kale varieties including tender Ethiopian kale, dandelion greens, onions, scallions, baby carrots, radishes, sweet potatoes, new baby ginger so tender you don’t have to peel it. Loads of watermelons (multiple red and yellow fleshed varieties to choose from), Japanese sweet crunchy green mini melons, beautiful Indian honeydew melons, papayas, passionfruit, and loads of Mediterranean figs, beautiful cut flowers, lemongrass, garlic chives, recao, dill, cilantro, rosemary, the basils. Local honey from Errol. Early birds will find a few cucumbers and the first of our cherry tomatoes (just a few pints). Get ready for yummy salad! Farmer Luca bounces in his giant wheelbarrow to express his gratitude for the recent rains and for the end of the endless US presidential election. Our passionfruit vines are loaded with flowers at the moment! Dragonfruit (pitahaya) ripening on the vine in November! Extended season for this summer crop! Sweet salad mix, baby arugula, baby spicy salad mix, cucumbers, sweet potatoes, Ethiopian kale, a few bunches of Italian dandelion greens, kangkong (Asian water spinach), fresh herbs (including Italian basil, lemon basil, holy basil, Thai basil, rosemary, recao, garlic chives,) a few papayas, the LAST (really!) dragonfruit and passionfruit. 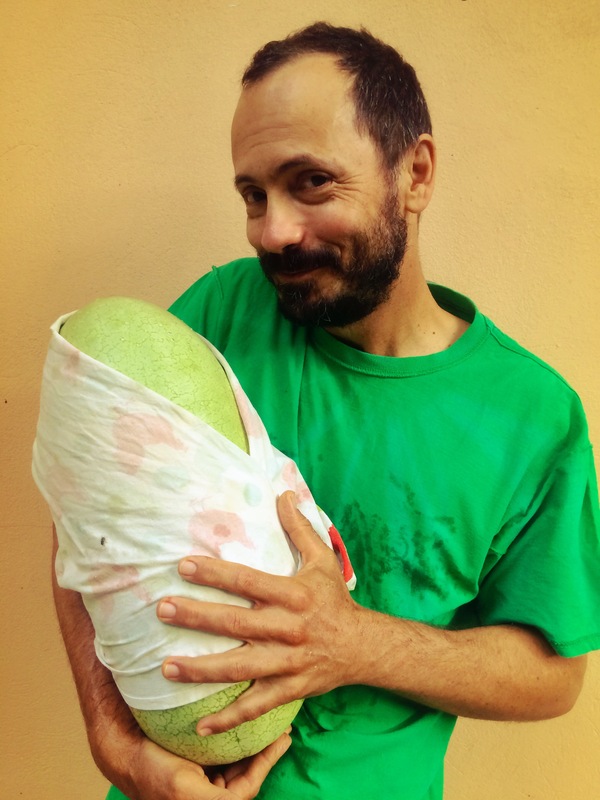 We’re happy to welcome back our good friend and farmer James Love to ARTfarm this season. He’s already fixed a lot of stuff we broke since the last time he was here! Farmer Katie has reupped with team ARTfarm to work the gardens and pastures for the fall season, and you’ll see Heather back again, helping out at most farmstands and bringing her fresh eggs from ecstatic chickens and selected organically produced produce from her family homestead, Yellow Door Farm. We’ll have other special guests, including fishermen stopping by when fresh fish is available. And our farm kid is carefully tending lots of native tree varieties to plant and to sell this season! The ARTbarn gallery/studio (the old tool shed you walk through to get to the farmstand) has been repainted and patched up, and there will be some fresh new paintings to ponder. Last year (2015-2016) we began a slow recovery from the drought and damage from South Shore brushfires with a lot of experimental permaculture techniques (we opened in mid-December last year!). This season, thanks in part to a general return to more favorable conditions and a six-day rain bonanza in the last few weeks, our rain catchment ponds have been mostly replenished. We are grateful to make it to your holiday table this year in time for Thanksgiving, Friendsgiving, Fall Harvest Celebration, or however we choose to celebrate coming together in these socially progressive days! We hope you’ll enjoy time with family and friends, and count and share your many blessings. Can’t wait to see you all – we’ve missed familiar faces, we welcome new customers, and we’re looking forward to sharing and enjoying the fruits of the season! Lots more treats to add to the produce list in the coming weeks. Thank you for your support. Overall, the tomato plants are slowing down as the weather gets slightly hotter, but we still have tons to pick and for you to enjoy! Our sunflowers are getting ridiculously tall! They seem to love our soil. We field tested some cut sunflowers this week in a jar of water and they lasted at least six days with no added care. If you change the water more regularly and add a couple of tablespoons each of apple cider vinegar, sugar, and baking soda to the water, they should go even longer! 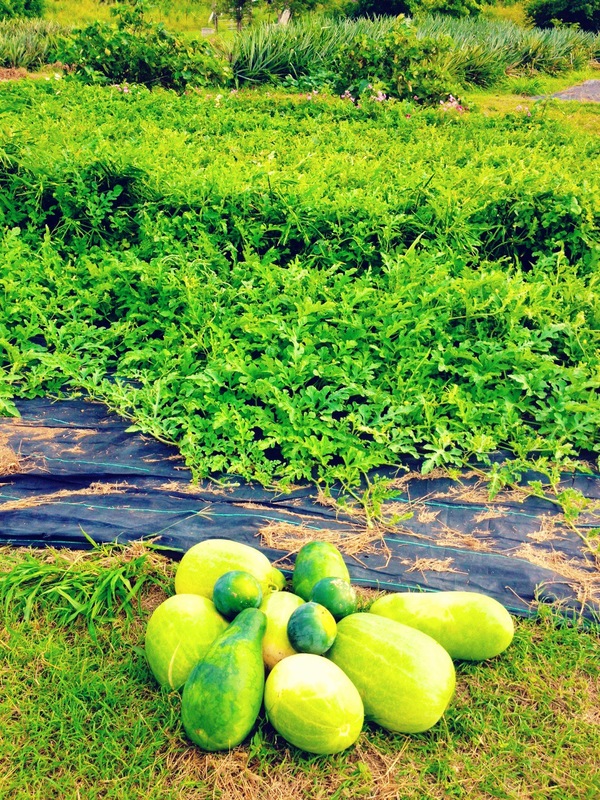 Can you find the melons in the melon patch? Lots of exciting varieties, soon come! The arts are very busy this weekend with the VI Lit Fest partying hard at UVI and CMCArts, and various art exhibitions including a mix of student and professional work at the Good Hope Country Day School. Get out and enjoy some culture, or stay in and practice your own creativity! Yesterday’s full moon coincided with Earth Day. 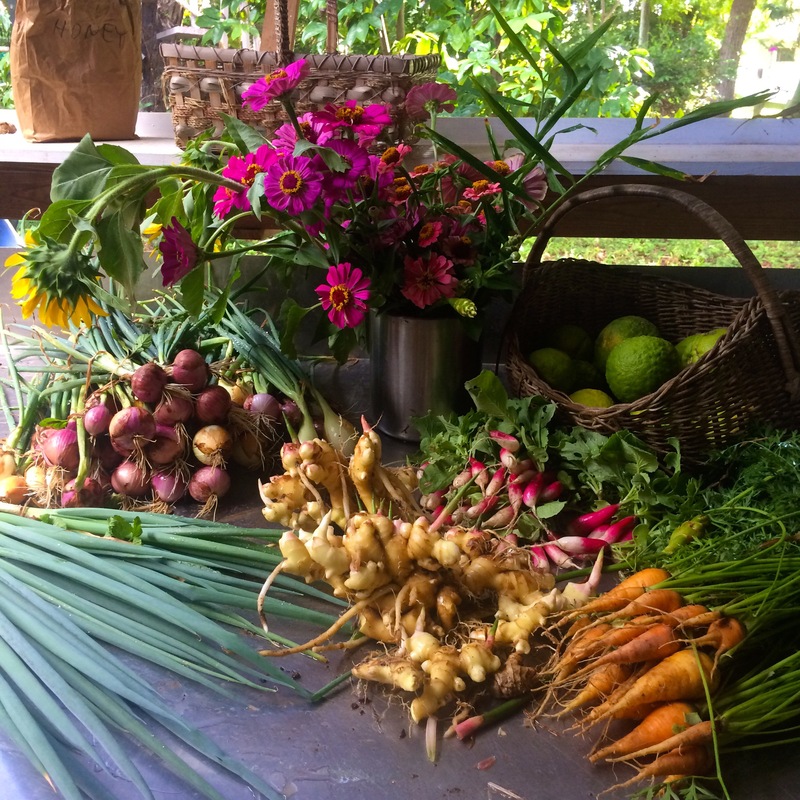 We hope that more and more people will join communities like ours of small farmers and their dedicated customers, to practice Earth Day consciousness and conservation around the calendar all year long. Fiddlewood Farms goat cheese is back today! Pairs perfectly with any and all of the following items: Sweet salad mix, baby arugula, baby spicy salad mix, lettuce heads; onions, radishes, pumpkin, sweet potato, green, red, and orange bell peppers; seasoning peppers, both types of hot peppers, a few cucumbers, a few bunches of kale, bunched arugula, parsley, Italian basil, chives, rosemary, lemongrass, ginger root, papaya, passionfruit, cherry tomatoes, medium heirloom and red tomatoes, recao, farm fresh eggs from ARTfarm and from Heather’s hens; and more of Dr. Bradford’s unbelievably fresh, delicate goat cheese. Aaaand…Decorate your table or make a lovely gift of fresh cut zinnias and sunflowers.